When INXS first hit the UK chart with What you Need in 1986 it went relatively unnoticed. The song only reached number 58 and their next three singles; Listen like Thieves (number46), Kiss the Dirt (Falling Down the Mountain) (number 54) and Need You Tonight (number 58) were all by-passed by the general British public. It was only when their next single, New Sensation, reached number 25 people took notice. What many won’t realise is that by 1988 when Never Tear Us Apart came along, they’d been going for 11 years. But this week let’s look at one of the early releases. They were formed in Sydney, New South Wales in 1977 as the Farriss Brothers but not formed by them. Tim and Andrew Farriss were in different bands, Andrew in Doctor Dolphin and Tim in Guinness and each had future INXS members but it was Andrew who invited his school mate Michael Hutchence to join Doctor Dolphin and guitarist Tim was with sax player Kirk Pengilly. In 1977, Tim asked his brother and Hutchence to join forces, they also invited Jon, the youngest of the Farriss brothers. This week I focus on their seventh release which was called Don’t Change which missed the UK charts altogether but did garner a little airplay in 1980 when radio stations dared to play something different especially shows like Paul Gambaccini’s American hits programme and Don’t Change did reached number 80 Stateside. 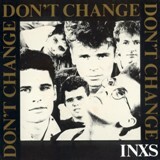 The song, although credits the writers as INXS, it was actually created by Michael Hutchence and Andrew Farriss in 1982 during the recording of their third album Shabooh Shoobah and is a very simple message, “Everything Changes, or does it? Nothing lasts forever and yet most of us at some point in our lives want it to.” Andrew said. The accompanying video was meant to be shot on an airport runway in Southern Australia, but on the day it was pouring with rain and the plan had to be cancelled. The video was directed by Scott Hicks whom Hutchence wanted to bring in because he had worked with him on an Australian film called Freedom for which Hutchence had provided the tracks Speed Kills which was Hutchence’s debut solo single and Forest Theme. If was Scott who had the idea to use hangar in a nearby airport. In 2014 Channel 7 in Australia aired the mini-series INXS: Never Tear Us Apart and on the back of that, the song was download enough times to allow it to creep into the lower end of the Aussie chart. Later the same year Bruce Springsteen included it in his Australian tour which was so well received that he then included it on the next leg of the tour in New York. It’s also made its way into the sports world by the Maryland-based Baltimore Ravens football team, who, when there’s a dispute during the game and the referee finds in their favour they play a snippet of the chorus. In the film world it was included in the 2009 film Adventureland. INXS went on to have 26 UK hits and nine studio albums between 1986 and 2002. Lead singer Hutchence was often in the press because of his love-life and string of affairs which included Kylie Minogue and Paula Yates – with whom they had a daughter, Tiger Lily. It’s unbelievably just over 20 years since Michael Hutchence committed suicide and after Yates died of a heroin overdose in 2000 Lily was placed in Yates’ former husband, Bob Geldof’s care. The band continued after his death and had three difference lead singers, Jimmy Barnes in 1998, Terence Trent D’Arby in 1999 and Ciaran Gribbin from September 2011 until the group disbanded in November 2012.